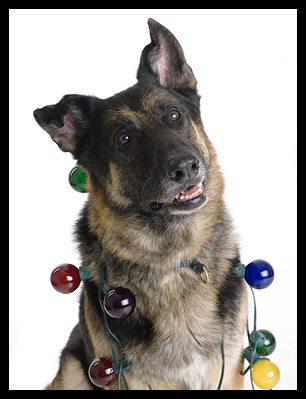 The holidays can mean special dangers for your pets. Make sure your pets have collars, tags or a microchip in case of escape with all the comings and goings. Provide a special, quiet place with fresh water for your pet to retreat to if the festivities and fuss get too stressful. Foil candy wrappers, wrapping paper, tinsel and ribbons can cause internal injuries if swallowed; the foil can act like a razor in the digestive tract. Many holiday treats – alcoholic beverages, rich fatty food scraps and luscious desserts or fruitcake – can be harmful and even toxic to pets. Never give your pets these foods (or foods that contain them) – onions, garlic, grapes, raisins, currants, alcohol, yeast, sugarless gum, chocolate, green tomatoes, raw potatoes, mushrooms and macadamia nuts. Poultry bones (turkey, chicken, duck and goose) splinter easily and can pierce or obstruct the throat, stomach or intestines if ingested. The skin is off-limits, too; its high fat content can trigger a serious inflammation of the pancreas or intestines. The water in the tree stand contains secretions (or chemical preservatives) that at the very least can cause a stomachache. Holiday plants – including ivy, lilies, holly, greens like balsam, juniper, cedar, pine and fir, mistletoe, hibiscus, poinsettias and amaryllis bulbs – are toxic or can cause severe gastric distress to both dogs and cats. Lights and cords can be chewed or easily strangle a curious pet. Candles and hot wax can quickly become disastrous to an inquisitive puppy or kitten; further, an exuberant tail or curious faces or paws can quickly tip an unsecured candle. Liquid potpourri – the liquid can cause severe chemical burns in the mouth, fever, breathing difficulties and tremors.